Bishop W. Francis Malooly, newly installed leader of the Wilmington, Delaware diocese in which vice-president-elect Joseph Biden lives, has said that he will not confront Biden on the abortion issue. “My own conscience tells me that I have a better chance of helping someone if I don’t alienate” him, the bishop told a group of young people at a Theology on Tap session. This item in the news infuriates me. 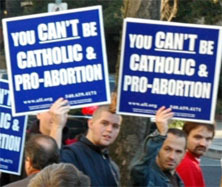 After so many bishops made us proud by courageously speaking out against abortion before the presidential elections, now we hear of Joseph Biden’s diocese in Wilmington Delaware. In my opinion, Bishop Malooly has taken the wrong approach, one that would be clearly denounced by the Fathers and Saints of the Church. If I am wrong I apologize in advance, maybe there is more to the news story than has been reported. Bishops have the job of educating the flock as to Church teaching. It is through teaching and moral boundaries that a bishop instructs his flock. His job it to instruct and warn a wayward sheep like Biben. If he decides to hold off reproving Biden until he has time to instruct him — so be it, then make a private and public instruction. 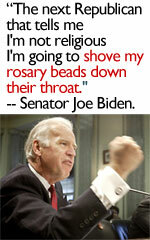 Will we hear of a meeting between them in which the bishop will instruct Biden and help form his conscience? But don’t just let it go on unaddressed which implies that Biden is OK, and that all dissenters are OK and any unrepentant sinner can freely continue to partake in the life and sacraments of the Church. This is not Church teaching or practice. It is the kind of thing that causes scandal. Why not just invite every unrepentant sinner and violator of Church law to freely come for communion? Where are the heroic bishops of the past that made a king sit outside the Church doing penance even AFTER he went to confession (St. Ambrose, see note below). Biden is more than a “supporter of abortion,” he is a lawmaker who supports and promotes abortion as the law of our land. He has trumpeted his dissent and pro-abortion stance across the country, from podiums to microphones, from speeches to passing laws. He has thumbed his nose at the bishop and the whole Church. He needs to be confronted! This has to change before the Church in America will change. We have a long way to go. I think bishops like this need to re-examine themselves and the teaching of the Church, to remember the courageous bishops in other parts of the world are dying as martyrs because they stand up for Jesus Christ, and bishops of the past who took stances of tough love in doing the right thing. 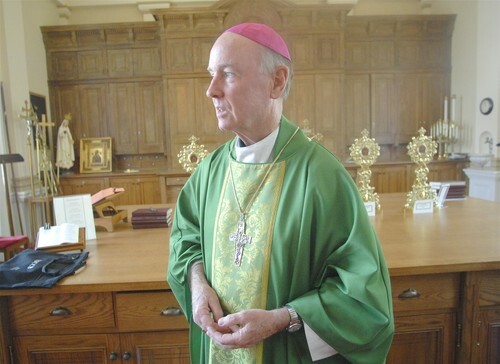 TAKING A BREATH: Having said all this and vented a bit, I want to say that if I ever meet this bishop I will thank him for being a bishop and kiss his ring. I know that being a bishop is probably the toughest job in the world and often thankless. I will pray for him and I appreciate him. I would not myself want to confront politicians, so I sympathize, but a bishop is called to be a shepherd and I love them for accepting the job even if I get frustrated at times. He sat in my office, a Turkish scholar and theologian who helps people who are tortured for their faith. According to Ziya Meral, it’s the converts from Islam to Christianity who are some of the most forsaken on Earth. The police don’t help them; their families hate them; and their friends want to kill them. And some of the worst treatment occurs in the gulags of America’s allies. It was there he encountered a man who had endured horrific suffering for leaving Islam.